Every year I am a little more prepared than the last and I am thrilled to share these Christmas Planner List with Printables so that you can be better prepared and enjoy your Christmas and Holidays. 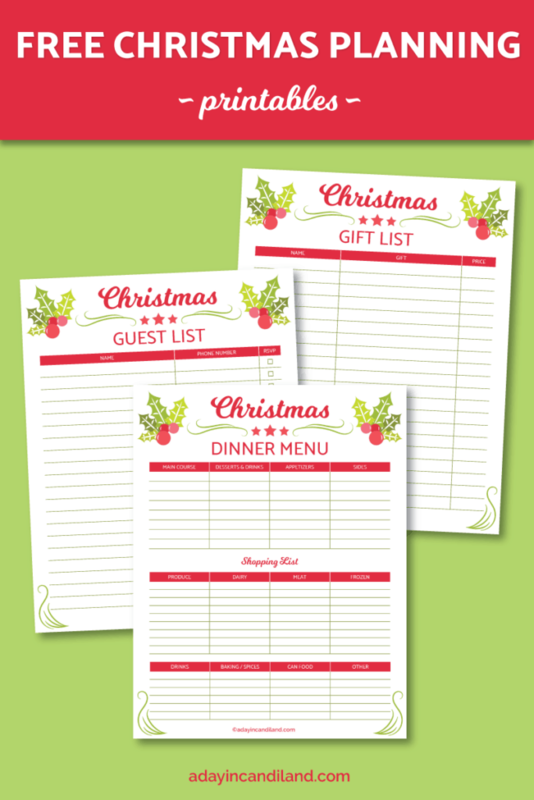 Last year I wrote about being prepared for Christmas Dinner and thought these printables would be a great addition. One of the first things I like to do in January is prepare a budget based on the previous year and make adjustments. Then I start a savings account and do an automatic transfer each month on payday and transfer 1/12 of the budget into a savings account. Last year this worked perfectly and I even added my tax return refund into the account and had a little more at the end of the year. Also since we focus on a monthly budget now, we can spend our money where we want instead of being out of control on our spending. I always like to add a little more than I think I need into my savings. For all those added extra gifts or items you might need. Here are the lists I have created for you. The earlier you plan these things out the better prepared you will be. Once you have it written down, when you are out shopping and see something you need to buy, you can cross it off of your list. Visual Tip: Make a secret board on Pinterest and pin all your recipes you plan to make, including any holiday baking recipes you will be making. Now you will have all your recipes together and you can print them, or just keep them in one place on your board and review as you start baking. I know you will enjoy these Christmas Planning List and Printables. Here are a few other desserts you might like. Subscribe to get our Christmas Planner along with weekly recipes, encouraging and budgeting tips by email. Candi Elm is a wife and mom who shares how you can simply create a sweet life with weekly encouragement, recipes, household budgeting and organizing tips. She currently lives in Southern California while blogging, baking and raising her children. Subscribe to get our latest recipes, budgeting and encouraging tips and receive our Free menu plan cheat sheet with 7 days sample recipes for Free. Success! Now check your email to confirm your subscription. You're almost there! Hey friends I'm Candi! A baking, Iced Tea drinking, budgeting mama. I Married my high school sweetheart and have 3 adult children. I finished culinary school a several years ago and have been baking and blogging ever since. A Day in Candiland helps busy moms create family friendly recipes while providing encouragement and frugal living tips along the way. I am excited you are here. Candi Elm and A Day in Candiland is a participant in the Amazon Services LLC Associates Program, an affiliate advertising program designed to provide a means for sites to earn advertising fees by advertising and linking to Amazon.com. Saving Busy Moms Time and Money with Weekly Recipes and Encouragement. By subscribing to our newsletter and free printables, you consent to receive new updates from our company.